In September last year, or thereabouts, I decided that the boys, or Hugo at least, might respond to and enjoy "X-Wing", the game of Star Wars spaceship combat. 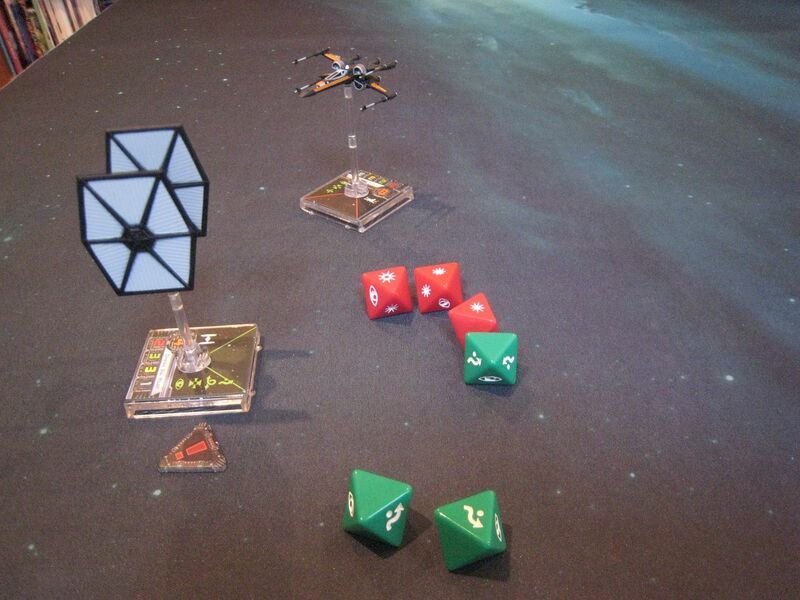 The game has a huge following, involves model ships, and the boys are pretty Star Wars obsessed. 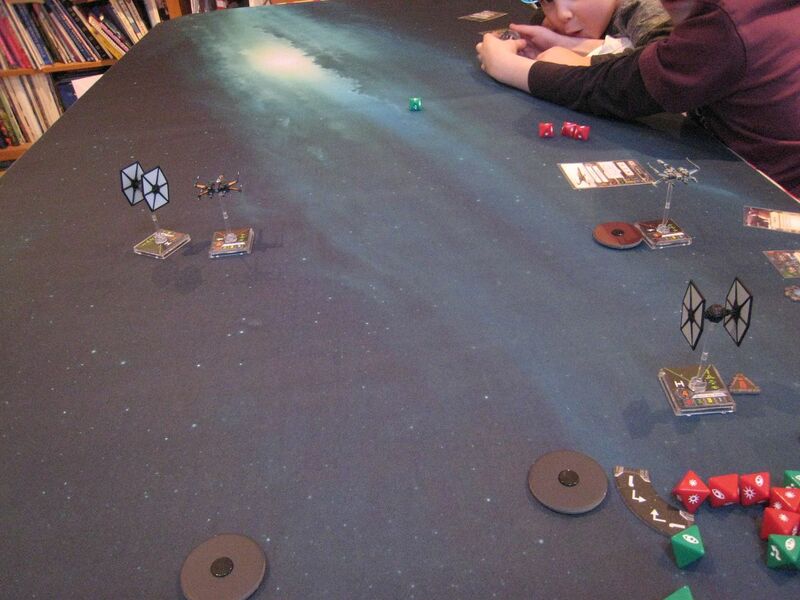 I reckoned that Hugo, who turned 7 in December, would be old enough to get stuck into the rules; Monty, who will be 4 in a couple of weeks, is clearly too young to appreciate the game but I knew he'd like moving his ships and rolling dice, and it would be impossible to keep him out of a Star Wars game. I knew that the biggest problem would be what generally happens when children play games and start losing. So I started buying ships when cheap deals presented themselves, and invested in (a) a 6x4 mat from Deep Cut Studios and (b) a large box from Feldherr to keep everything in. The boys were each given a core box set and additional ships for Christmas (they both had to have a Millennium Falcon - luckily there's an "original trilogy" model and a "Force Awakens" one). We've already had a couple of games, but this is the first where I've taken photos. What works best is if the boys have a ship each, usually on the Rebel/Resistance side, and I have a couple of (usually useless) Imperial ships. This time we decided to use our The Force Awakens ships for the first time. Hugo was Poe Dameron and Monty was Jess Pava, from Poe's squadron - we're currently reading Marvel's "Poe Dameron" comic at weekends so the boys know who's who in Blue Squadron. I let them have 2 upgrades each, so they chose an astromech droid (BB8 for Poe and R2-D2 for Jess); Hugo chose the "Determination" pilot skill card, I think because he likes the picture. The game started as you'd expect. 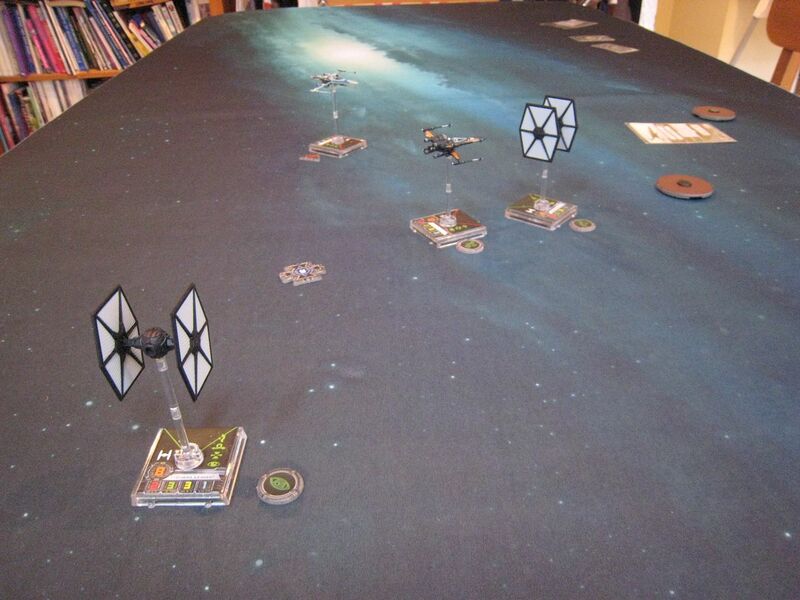 Both sides seemed to race to contact, although I noticed Hugo's Poe Dameron was heading straight for the edge of the table. "Why are you doing that, Hugo"? "Because I don't want you to fire at me." "Ok - you do know the point of the game is to fire at other ships; and as you're Poe you're probably going to be pretty good at it?" That continued for half the game, with Hugo determined to avoid combat. Monty was very keen to get stuck in, but the manoeuvre dial confuses him and he often found himself facing the wrong way. By this point, I'd banished Monty from the table because he had been disrupting the game by making burping noises unnecessarily. On destroying the Omega Squadron Leader, Hugo ran into the other room to announce his victory, only for Monty to start crying again and to wail "but I wanted to destroy Daddy!" Nice. 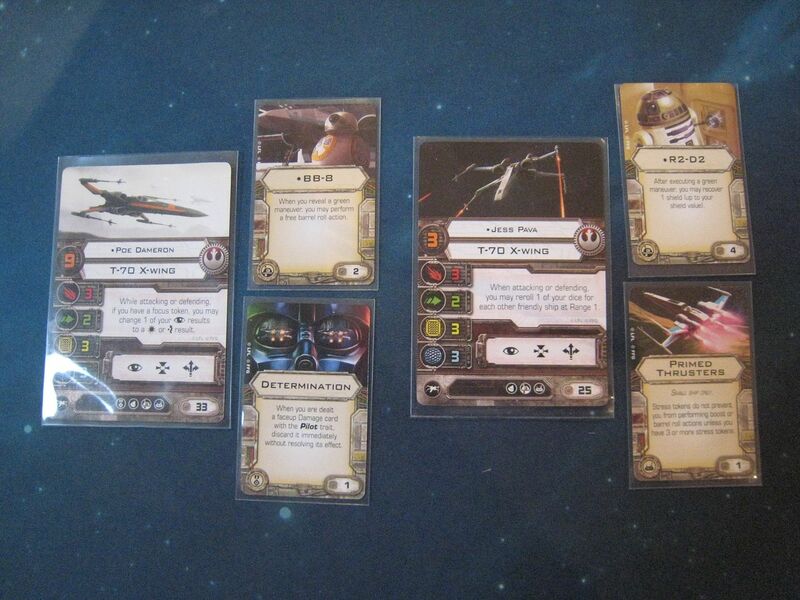 Luckily, by some happenstance Jess Pava had the other Omega pilot in range, and the latter was already on two damage cards. So it didn't take much for Monty to finish him off. The boys enjoy the game if they're winning; not so much if they're being shot at. But I'm sure that will change in time. Dad's happy being the loser if it keeps the boys occupied for a bit and helps get them into proper games. The King's Royal Regiment of New York ("KRRNY") was raised in June 1776 by Sir John Johnson, a loyalist who had fled with his family and other loyalists to Canada in May after harassment by local patriots. Johnson had started recruiting a battalion of loyalists in January and finished the process in Canada. (Johnson had his revenge on his local enemies - see my previous post on Frederick Visscher.) Eventually two battalions were raised, nicknamed "Johnson's Greens" and "the Royal Yorkers". The KRRNY was active in raiding down the Mohawk Valley and fought in the Saratoga campaign. During the Saratoga campaign, the KRRNY formed part of the force under the command of Colonel Barry St Leger which was sent up the Saint Lawrence river to besiege Fort Stanwix. 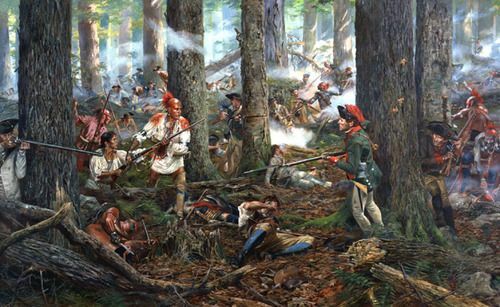 When St Leger heard that a relief force of militia under Nicholas Herkimer was on its way, he and his Indian allies prepared an ambush, which became the battle of Oriskany. Despite winning that battle, St Leger was forced to retreat back to Canada when he learnt that a further relief force under Benedict Arnold was looking for him. He had intended to link-up with the main British force under Burgoyne, but St Leger only managed to reach Fort Ticonderoga by the time that Burgoyne surrendered. The KRRNY remained stationed in Canada and continued raiding into New York and Vermont until the end of the war. The regiment was disbanded in 1784 and its men were given land in Upper Canada (now Ontario). So for wargaming purposes, the KRRNY would be handy for F&IW-style skirmish games as well as being a key component for the battle of Oriskany. 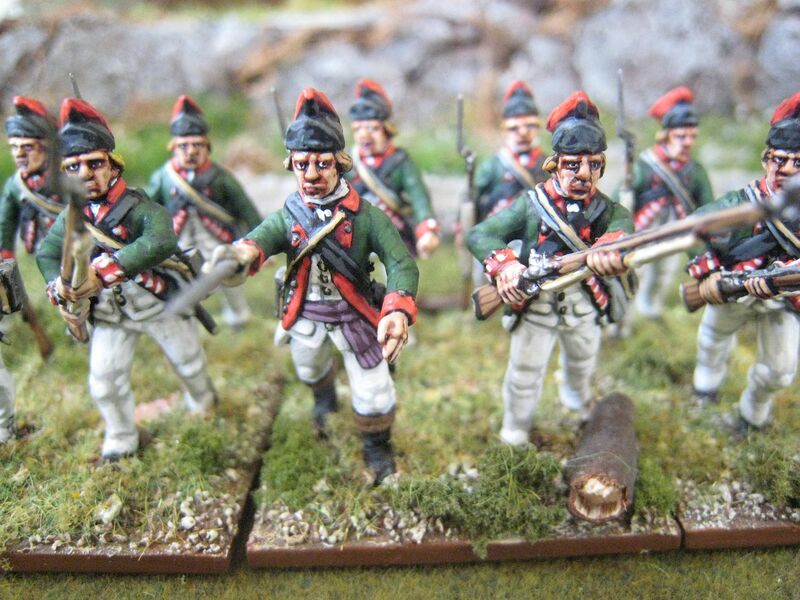 The "British Grenadier!" 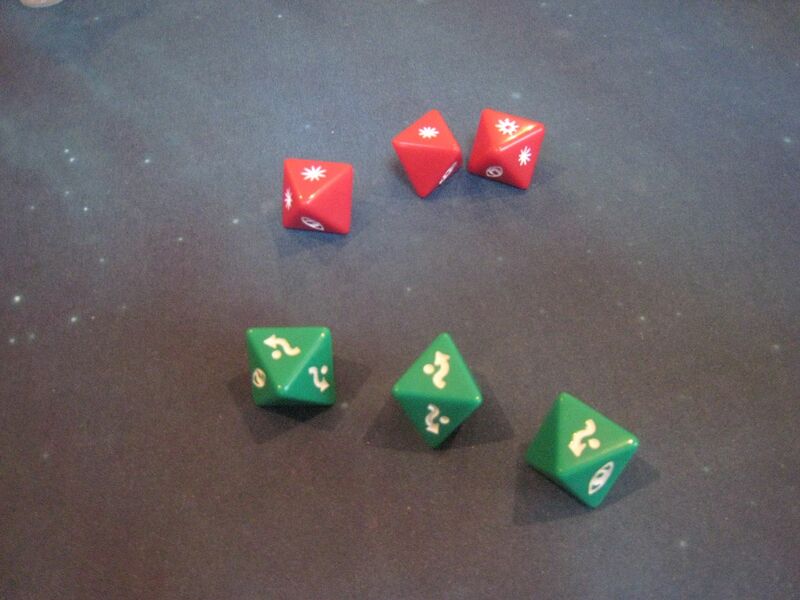 orbat for Oriskany has two units of the KRRNY, of 16 and 12 figures. The former is on the table from the beginning, whilst the latter is a reinforcement that arrives after a few turns. 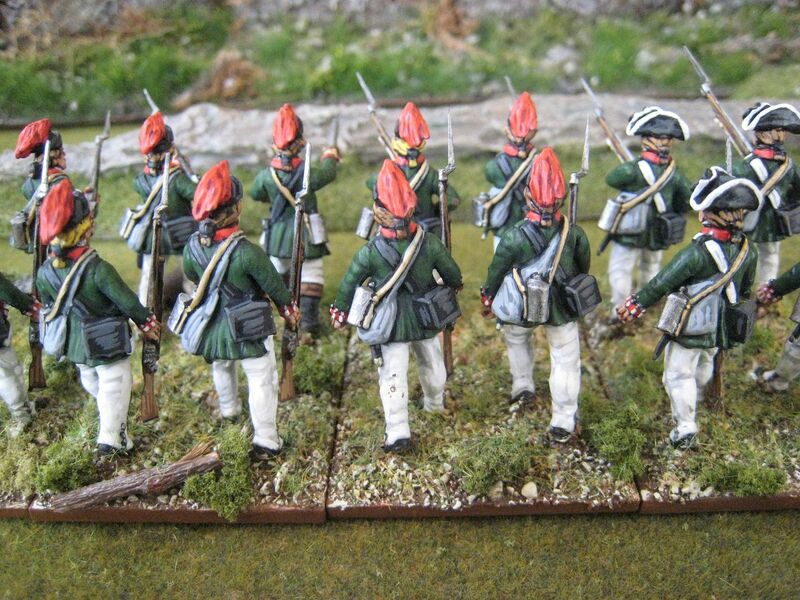 These figures are Perry plastic British infantry with "Saratoga" caps and tricornes and represent the 16-figure ambush unit. 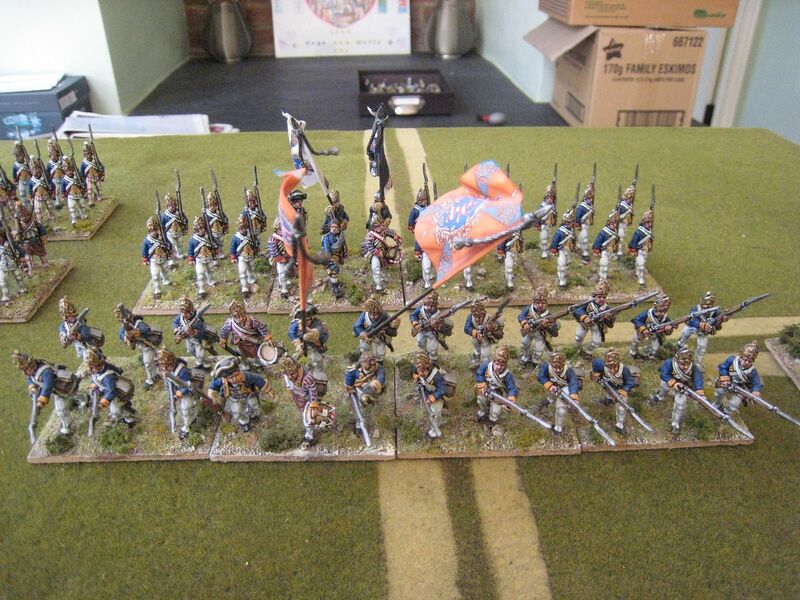 I wanted to re-create the look of the regiment in the Don Troiani painting of Oriskany that I used when I painted my Hanyery Tewahangarahken personality figure. I've re-posted the painting as the KRRNY figure can be seen clearly in the centre-right - green coat with red facings and a cap with a red horsehair crest. Before painting these figures I read all the materials on the excellent website of the re-created KRRNY about the unit's likely uniform. The choice is basically green coats faced either blue or red. The former was the established norm until Don Troiani's uniform researcher, James Kochan, concluded that red was the most likely facing colour. I won't post the arguments either way - anyone interested should read the articles on the website I've linked to. Kochan thinks that the regiment probably wore Saratoga-style cap-hats when on active duty; or at least it seems likely that the battalions' light companies would have done so. 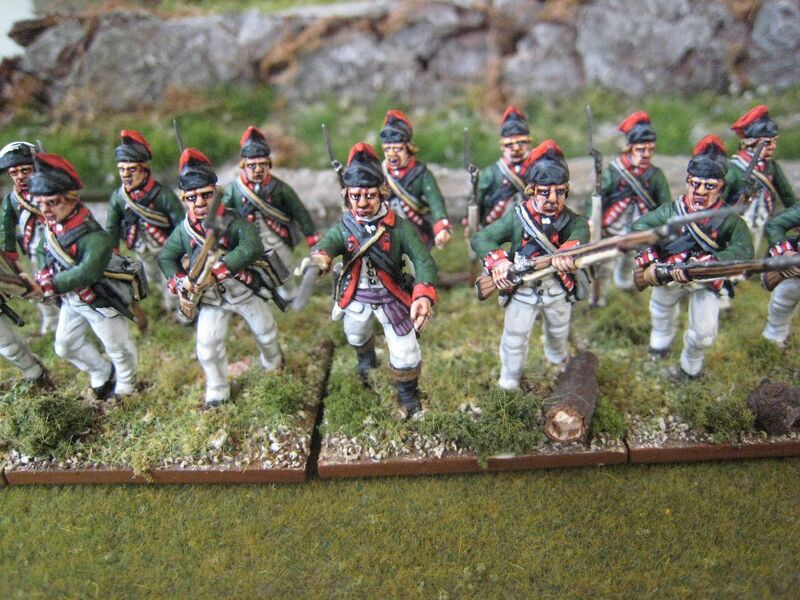 I've gone with that for 12 of the figures and given them black belts to suggest that these are light company men. 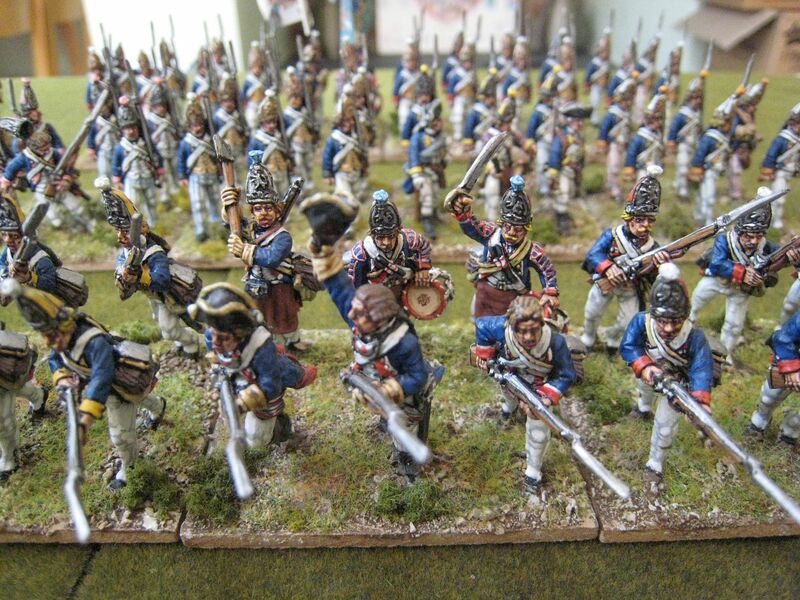 I then decided to paint the remaining 4 figures as normal centre company figures in tricornes, on the basis that (a) more than 12 figures for the light companies would be excessive and (b) I'd be able to add the 4 tricorne figures to the next batch of 12 to form a unit of 16 which I could use for other Loyalist regiments. I'll post those remaining 12 figures in a couple of weeks. The coats shouldn't have lace; I decided not to cut it off or paint over it, and so painted it white. So these figures are all a bit conjectural, to be honest, but they do capture the "look" I was after. 16 figures. Painted October-December 2016. In May 1775 the Rhode Island Assembly voted to raise troops to contribute towards what then became the Continental Army (the Rhode Island contingent being called initially the Rhode Island Army of Observation). 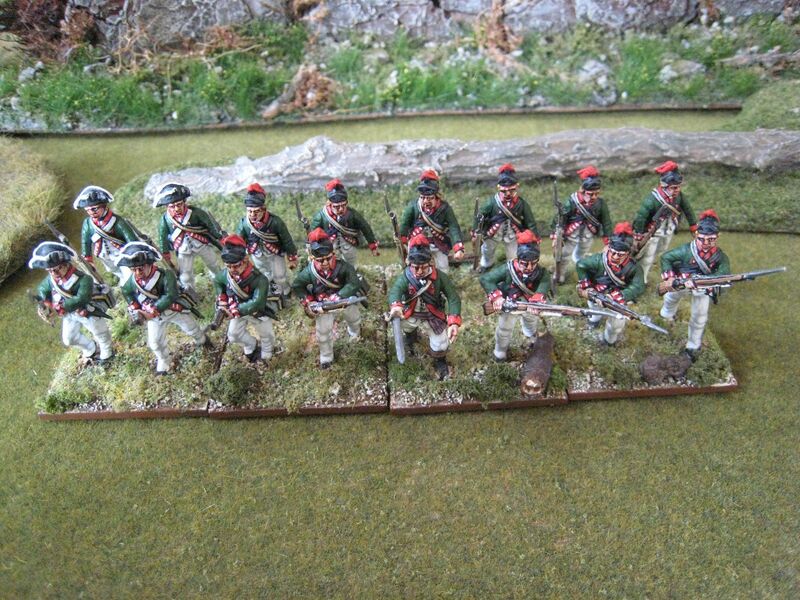 Three infantry regiments and a unit of artillery were formed. 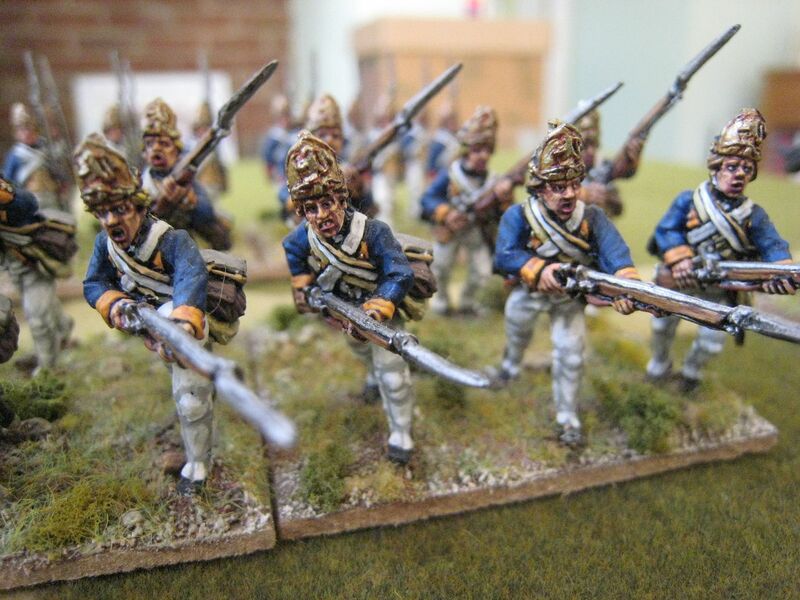 I'll write about what became of the infantry regiments shortly (I painted one last year and completely forgot about it, although photos of it appear in the fourth Caliver/"British Grenadier!" scenario book). In the meantime, here is the artillery train. The uniform was notable for its brown faced reds coats and the leather caps. These caps had a front of black leather which was decorated with a gold painted anchor and the words "For Our Country" painted above it. Some time around December 1775/January 1776 the unit was incorporated into the Continental Artillery Regiment and at some stage thereafter the uniform was changed to the more common artillery uniform of blue coats faced with red. The unit was stationed at Boston in 1775 and then New York, and companies fought in the Saratoga, Philadelphia and Monmouth campaigns. 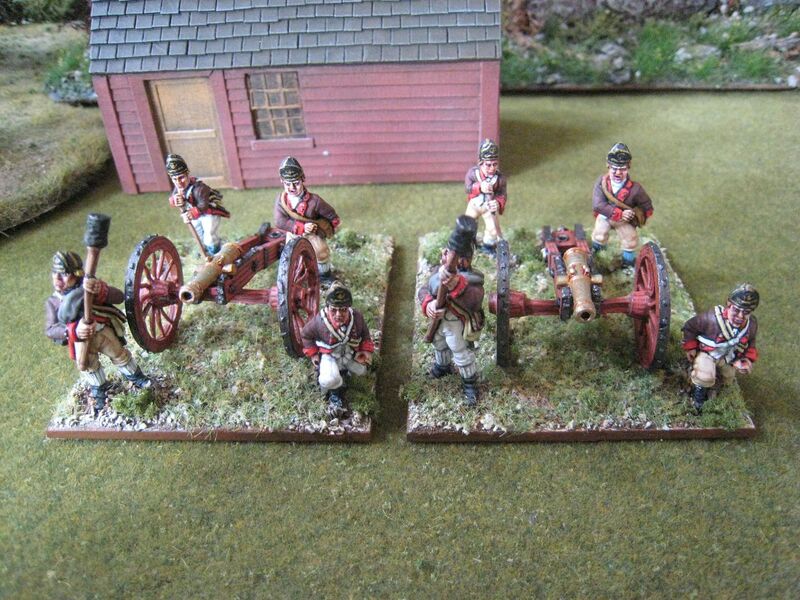 These are most of the figures from Old Glory's pack of Rhode Island artillery. The pack also contains two figures of an officer waving a sword - I haven't painted those because both swords had broken off. 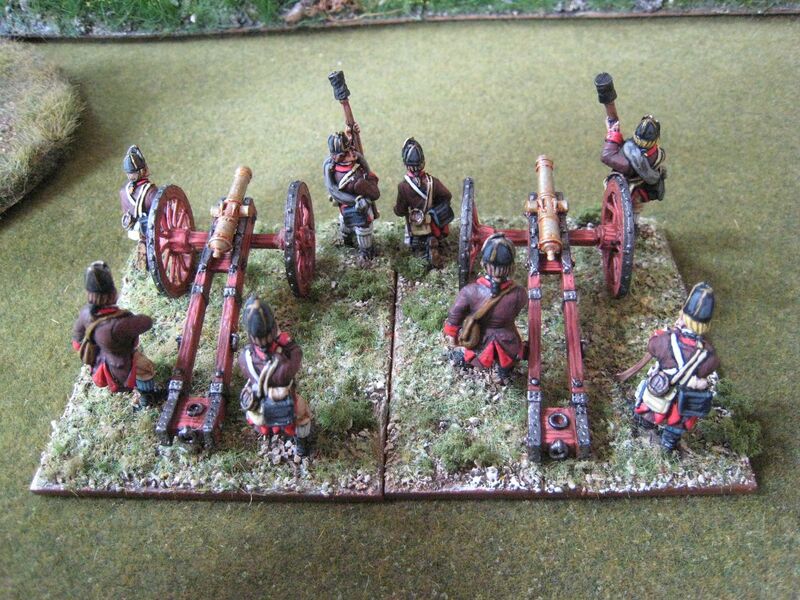 My artillery pieces have 4 crew members on a 60mm x 70mm base, so I don't need those officers anyway. I may at some stage try to glue one of the swords back on and paint the figure as John Crane, who commanded one of the unit's companies. These figures are typical Old Glory sculpts - some are better than others and it's difficult to know precisely what's happening. It looks as if the crew are preparing to fire, but there's no one with any sort of match and the chap with the handspike looks as if he's trying to move the gun. 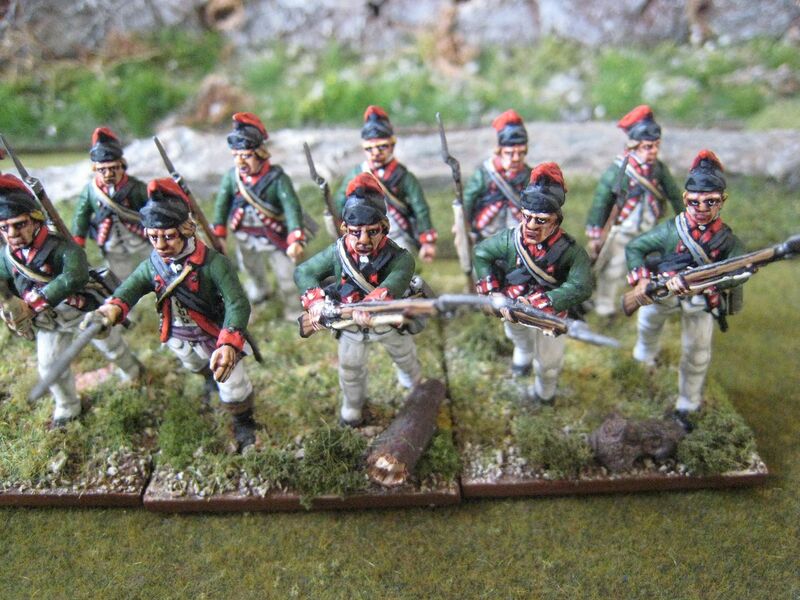 Anyway, I'm not all that bothered and I think the crews generally look ok. Perry Miniatures make a pack of figures in the Rhode Island uniform. That was released after I'd already acquired the Old Glory figures and it is hard to justify buying another pack. Anyway, I think I've done the best I can with these figures, and having a couple more 6-pounder models is always useful. 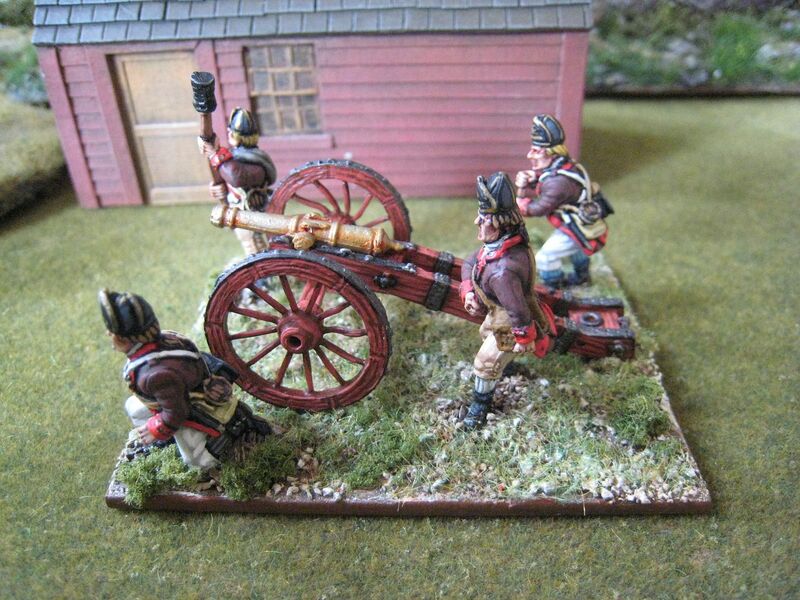 I painted the guns in my "red oxide" colour, which I discussed some years ago in this post. As the unit history above indicates, figures in this uniform are really only fit for service in 1775 and early 1776, Long Island being the most likely battle to use them in (even though the uniform may well have changed by then). 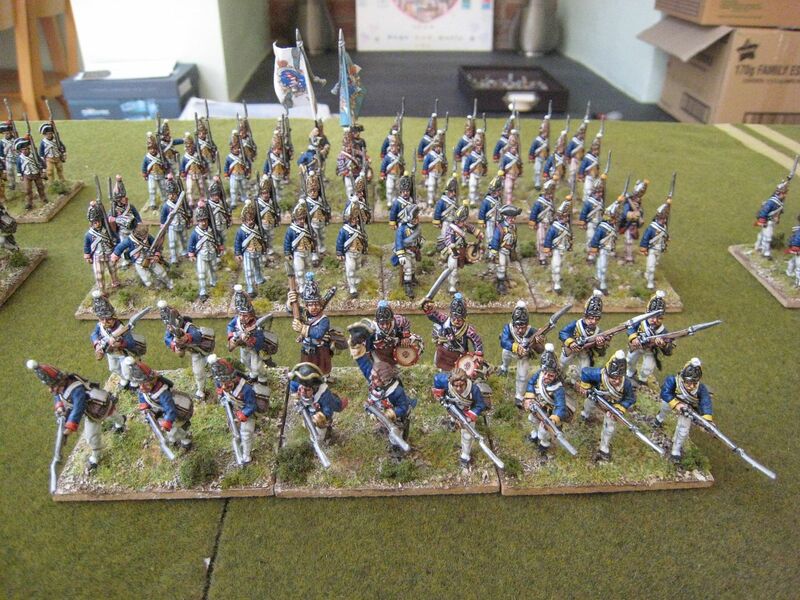 The unit fought at Newport in 1778, most probably in the standard blue faced red uniform, but I suppose I can use these figures for two of the eight American guns that are required for that scenario. I now have seventeen American gun crews, which is far more than one needs for the AWI - the largest numbers are at Brandywine and Monmouth, which require respectively twelve and nine guns on the American side. 8 figures and 2 guns. Painted December 2016. Frederick Visscher commanded the Third Regiment of Tryon's County's militia, and fought at Oriskany in the rearguard of the American column. Visscher was born in 1740 and, like many settlers in the Albany area, was of Dutch descent. He served in the F&IW and joined the patriot cause with his two brothers, John and Harman. Visscher's friends and neighbours Colonel John Butler and Sir John Johnson both chose loyalty to the Crown. 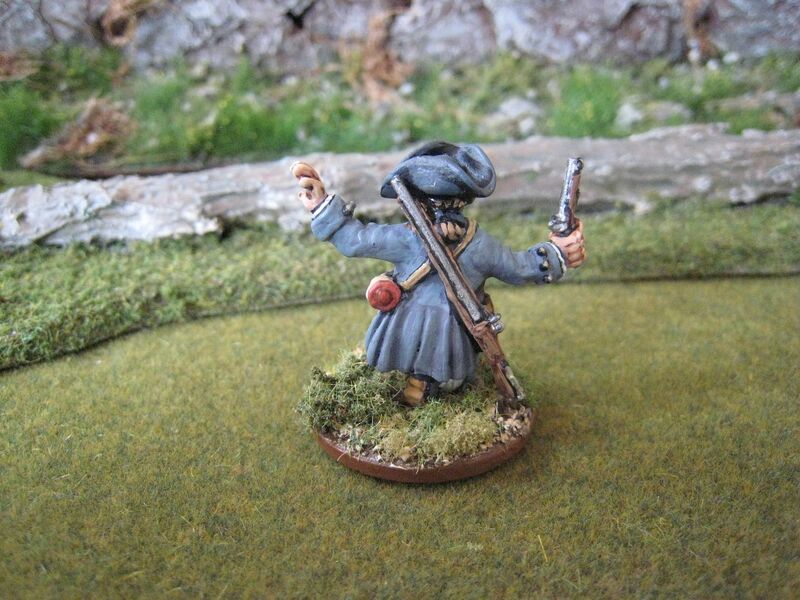 As a veteran of the F&IW, Visscher was given a colonelcy in the local militia. 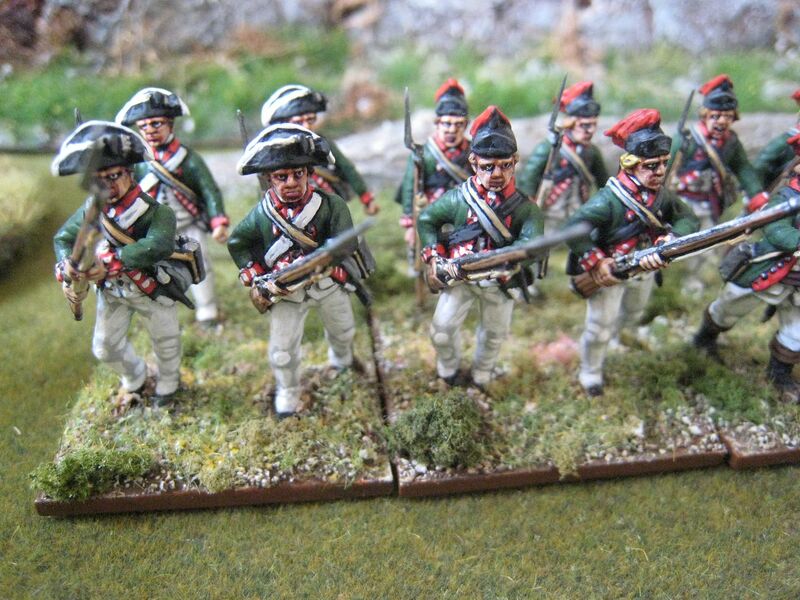 His brothers were also commissioned into the Third Regiment. 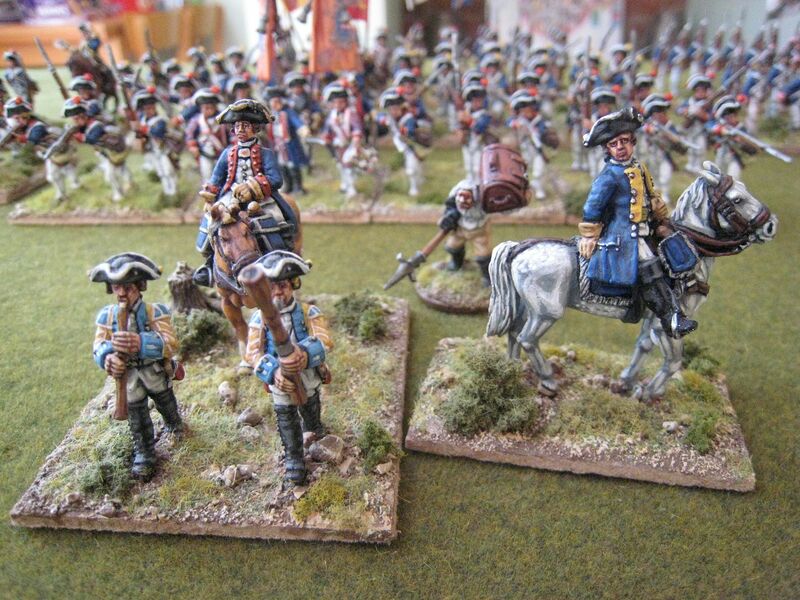 Visscher and his men were at the back of Herkimer's column, guarding the baggage wagons. After the ambush was sprung, Visscher found himself cut off from the rest of the force. His men fought their way back through the Indians who had encircled them and retreated back the way they had come to Fort Dayton. They were pursued by the Iroquois and bodies were found some miles away (records rather chillingly mention "Major Blauvelt and Lieutenant Groat, taken prisoner and never heard of afterward"). In May 1778 charges of cowardice were brought against Visscher and certain others who were accused of running away and abandoning the rest of Herkimer's column. However, nothing seems to have come of those charges, at least as far as Visscher was concerned. He continued to serve in the militia and seems to have been held in high regard. It appears that in May 1780 the home of Visscher's parents was attacked by a band of Tories and Indians led by Sir John Johnson while Visscher and his two brothers were visiting whilst on leave. A vicious fight in the house saw his brothers killed and Visscher himself scalped and left for dead after he had been hit in the back by a tomahawk. The house was set on fire but Visscher managed to help his wounded mother to safety. Apparently Visscher had a silver plate made to conceal his scalping scar during public occasions. After the end of the war, Visscher became a judge and a member of the state legislature. He died in June 1809. Visscher appears in the "British Grenadier!" 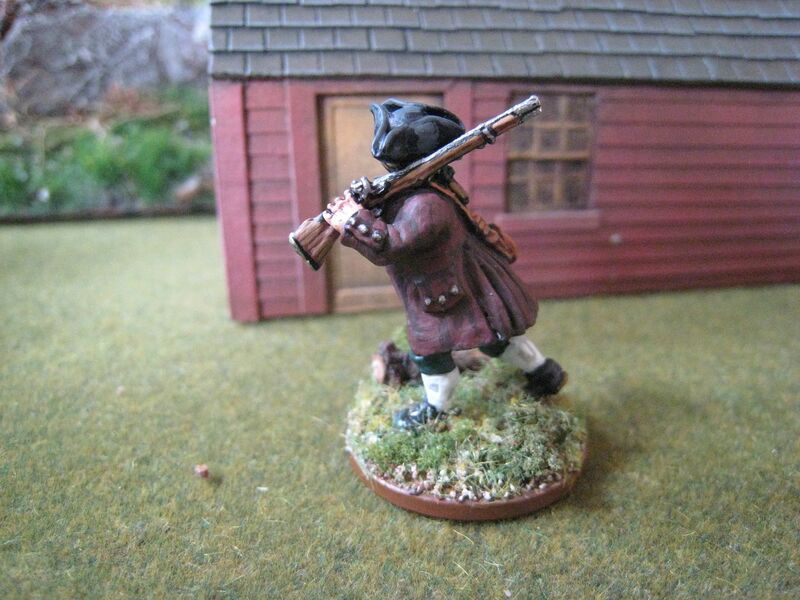 Oriskany scenario as a brigade commander and this figure is of course a companion to those of Lieutenant-Colonel Ebenezer Cox, Brigadier-General Herkimer and Hanyery Tewahangarahken. 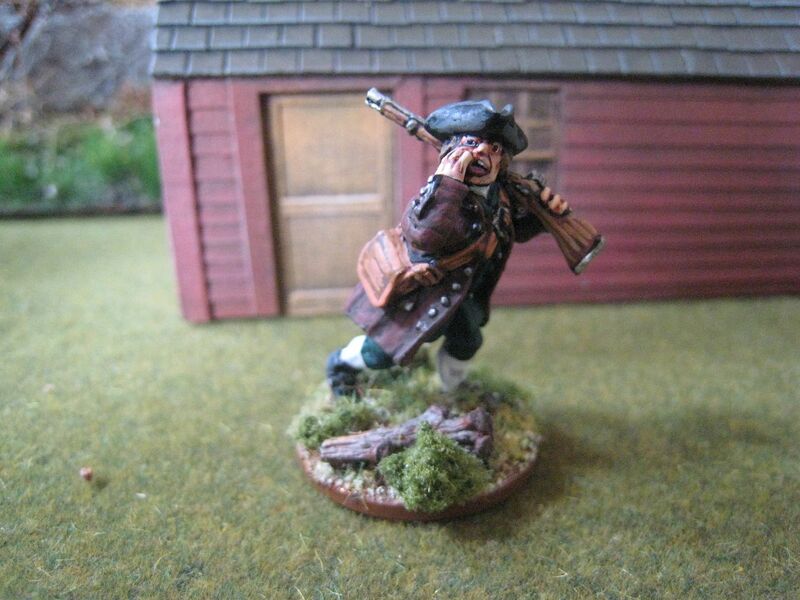 It is another one of the figures from Galloping Major's "Anglo-American Militia Command" pack in their F&IW range. 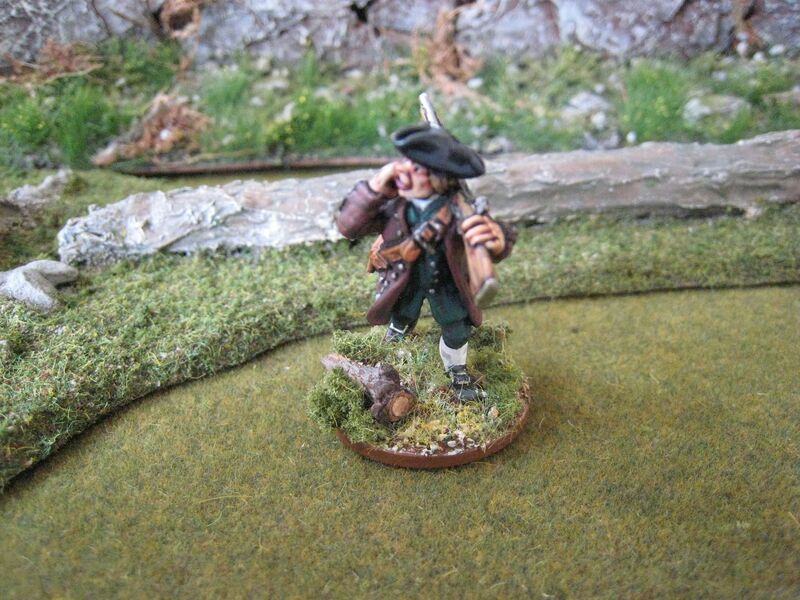 As I said in my post on Ebenezer Cox, Visscher should be mounted but (again) I like this pose, which suggests he can hear the ambush has started. Given that he was a prominent, senior officer, I wanted to give Visscher some decent clothes and so he appears in a more colourful suit than I suspect he wore on the day. 1 figure. Painted December 2016. I'm going to kick off the new year with some more personalities. Colonel Ebenezer Cox was one of the commanders of the vanguard of the American column that was ambushed at the battle of Oriskany on 6 August 1777 while on its way to relieve Fort Stanwix. He was born in June 1741 and was killed at the battle. His official position at the time of the battles appears to have been second-in-command of a unit of Tryon Country militia (Brigadier Nicholas Herkimer being the commanding officer of this unit). Apparently Tryon County's militia was formed into five regiments, each with distinct recruiting districts - Cox led the First Regiment, with men drawn from the Canajoharie area. In my post on Herkimer, I noted that on the morning of 6 August Herkimer had misgivings about pushing on to Fort Stanwix before reinforcements had arrived, but was cajoled into continuing his advance by his other officers. Cox is named in histories of the battle as being one of those officers who accused Herkimer of being a coward and a Tory. Cox must have been with Herkimer at the front of the column when the Crown forces attacked - he and several other officers were killed in one of the first vollies, whilst Herkimer was hit in the leg shortly thereafter. 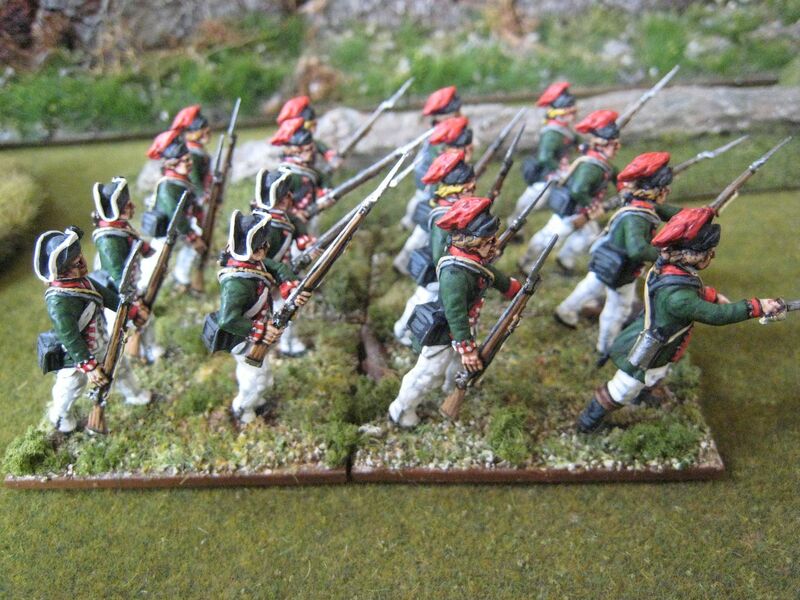 The First Regiment appears to have lost five of its captains and one lieutenant in the battle and so must have been pretty cut up in the battle. So unfortunately, the real Ebenezer Cox (who was the father of four young children at the time) had didn't live beyond the battle's opening stages. However, he is listed as the vanguard's commanding officer in the "British Grenadier!" Oriskany scenario and so I wanted to have a figure to represent him (and act as another militia commander more generally). 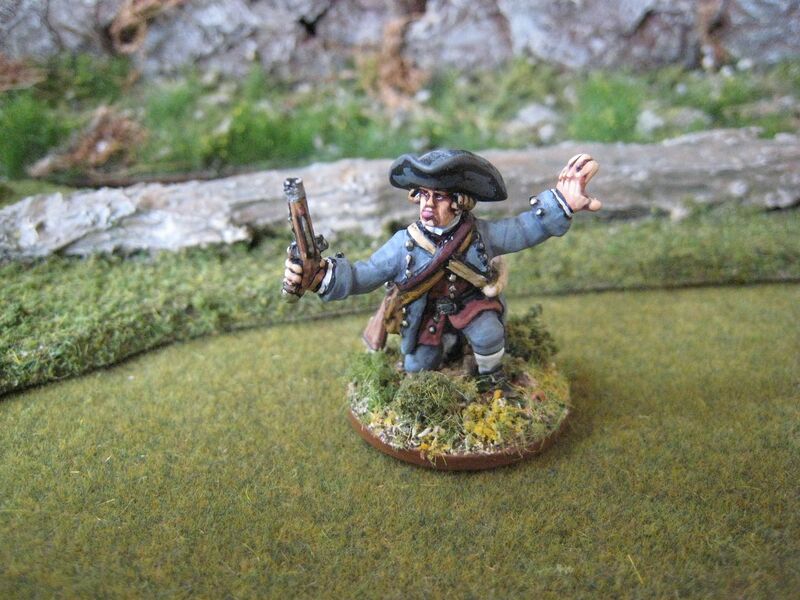 This is another Galloping Major sculpt, from the "Anglo-American Militia Command" pack in their F&IW range. The look and pose of this figure is perfect, I think - running for cover just after the ambush has been sprung. Also, unlike a lot of command figures who just stand around, this chap is actually shouting orders. I suppose militia commanders should be mounted, but to be honest I think they look better on foot - I expect they jumped off their horses pretty quickly at Oriskany. My first post of the year is almost always a self-congratulatory celebration of another year of blogging. At times over the years I've felt rather embarrassed when writing this post, as some years saw far less output than others and there have been times when this blog seemed rather comatose. However, this time I can celebrate reaching 10 years, and whilst the regularity of posts over those years has been very inconsistent at least the blog has managed to keep going for a full decade. Like the Continental Army in the AWI, "Tarleton's Quarter" may sometimes look as if it's been beat, but it always manages to rise up again. This year things began quietly but picked up in the second half of the year, before tailing off sooner than I had intended in December. That means there's a backlog of figures to post about, so the figures below don't tally with what I've posted about over the past 12 months. As always, I'll try to be more regular with posts this year and I'm both grateful for and appreciative of all the kinds comments that are left here. 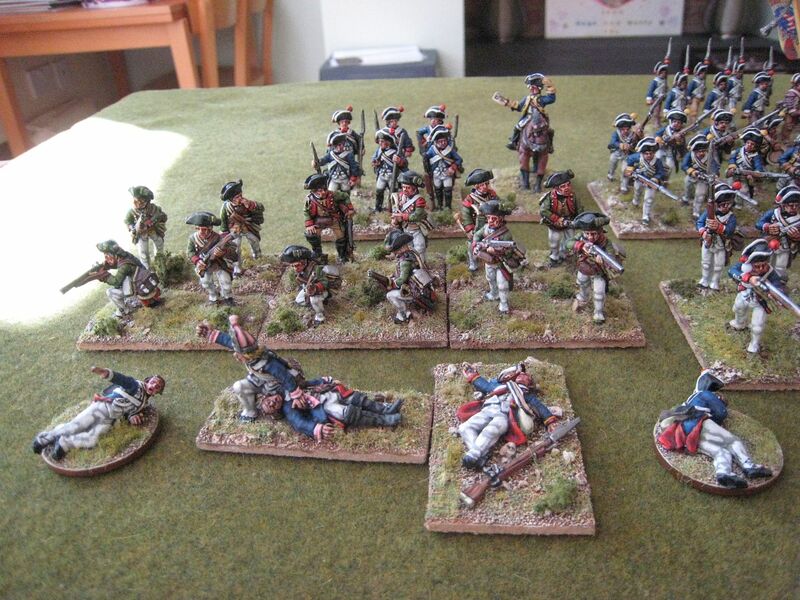 Painting time was spent almost exclusively on the AWI this year, and my main focus was on building up my Loyalist troops. My other key aim was to continue making inroads into my leadpile, which made 2016 a cheap year from a wargaming perspective as my purchases were limited to the figures I acquired at Salute and a few books. 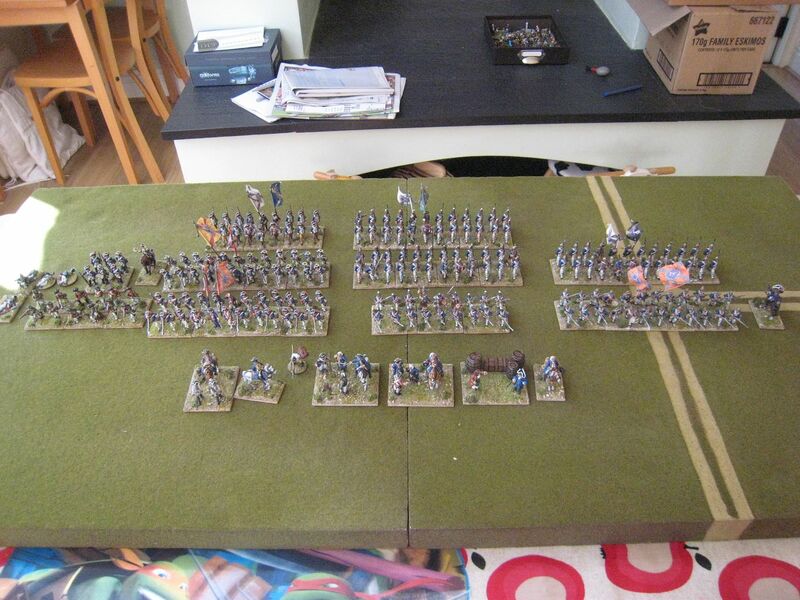 I've now worked through the bulk of my unpainted Perry lead; what's left comprises a couple of regiments' worth of Continentals and some bits and bobs. 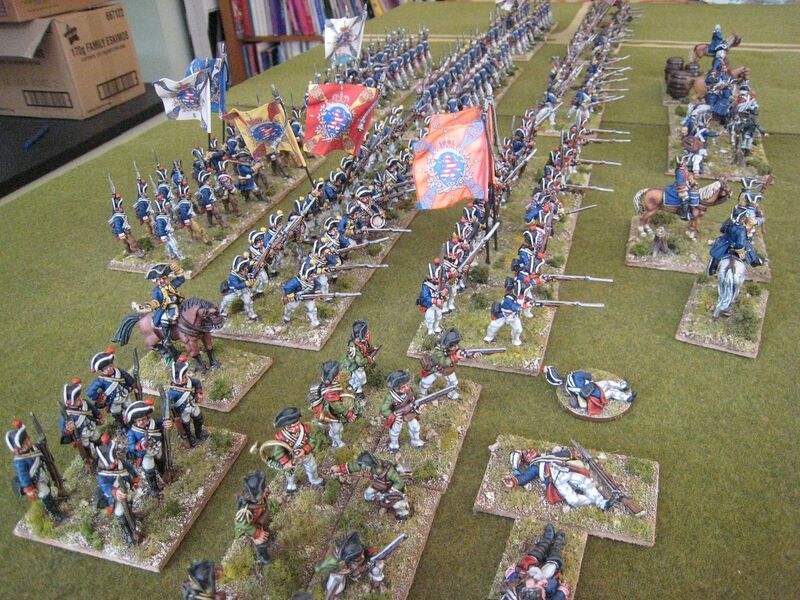 I still have about 60 Foundry figures and various Old Glory packs (one of which I've just finished). But I'm intending to have all these metal packs finished by the end of this year. I have a couple of other commitments, and finding painting time remains elusive; but it's a realistic target and I should be able to fit in a couple of other things as well. I'd like to return to the First Carlist War and make a start on my Cape Town 1806 project, but I'm in no great rush and the necessary inspiration will arrive in its own time. Appreciating now that, in painting terms at least, it's largely 1770-1870 that interests me I have been thinking about other periods - the War of 1812, the South America Liberation Wars, the Crimean War and the ACW all interest me. However, at the moment I feel I can't justify rushing off and buying more lead or plastic when so much remains unpainted. So it's more of the same for the foreseeable future, but I'm content with that. 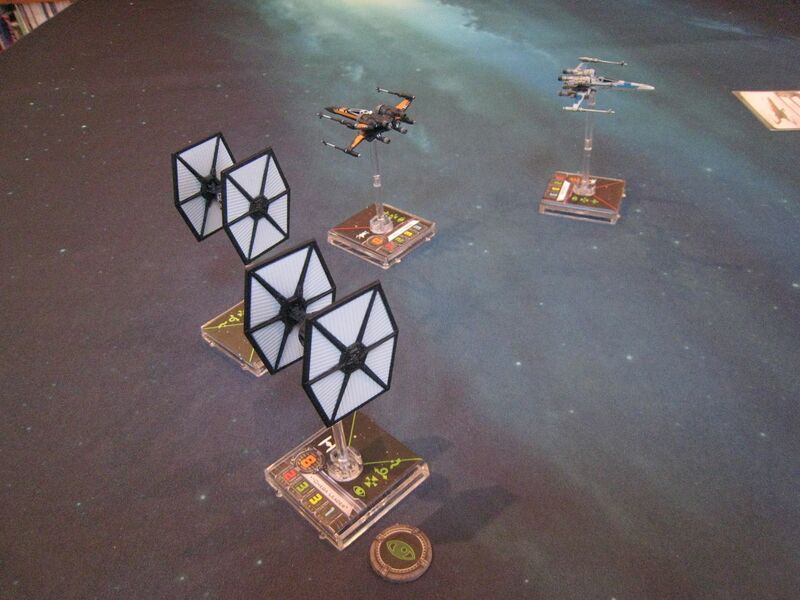 The only other development of note has been taking the plunge with the "X-Wing" miniatures game. I thought that when Hugo turned seven in December it might be the time to try out this game with him, given that he loves Star Wars and people I know had suggested he would be old enough to get to grips with it. 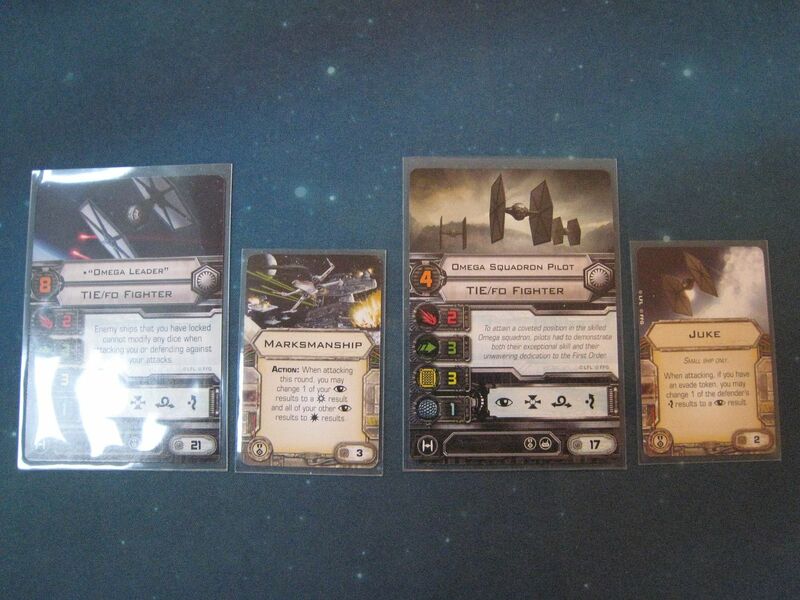 I'm delighted to say that we spent over 2 hours playing X-Wing last weekend and it looks like a hit. Monty is far too young to understand the rules or indeed play properly; but he likes moving his ships and rolling the dice so I'm hoping this game will produce some family fun over the next few years. So that's 325 "points" in total, which is a dead-heat with last year's total. The Napoleonic coach is the Warlord Games set of Napoleon's Berlin Coach; this was my Christmas hols project and I'm hoping to have it finished over the next couple of weeks. 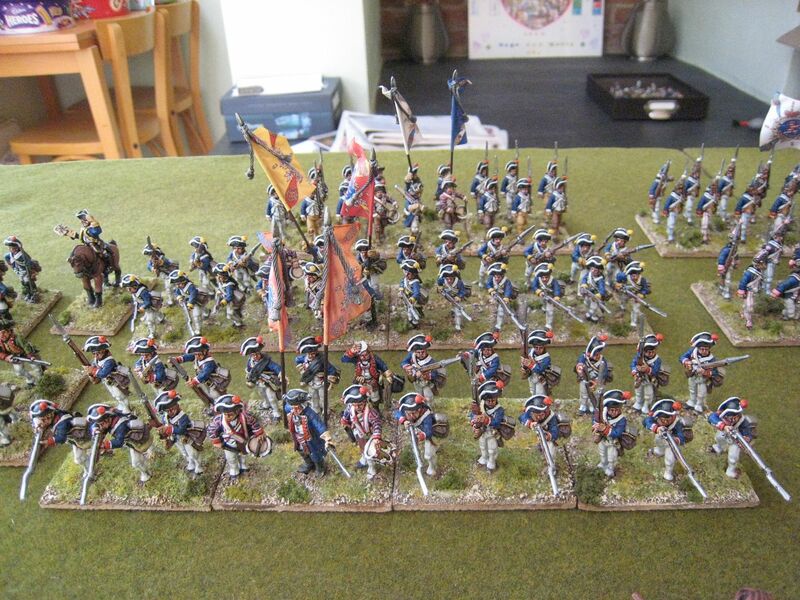 I painted 8 more ACW figures and will paint the rest of the battalion at some stage this year. 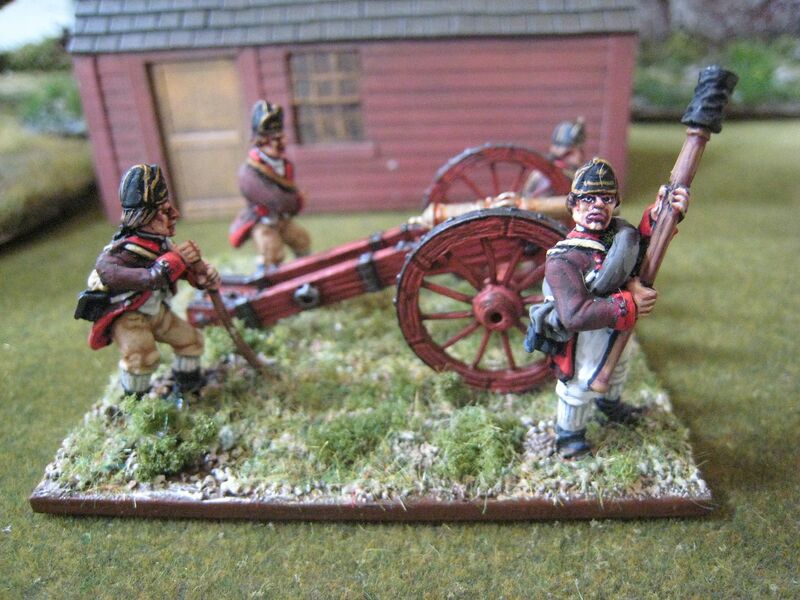 Coming up next on TQ: American artillery and militia personalities, the King's Royal Regiment of New York and some much-delayed Highlander command. 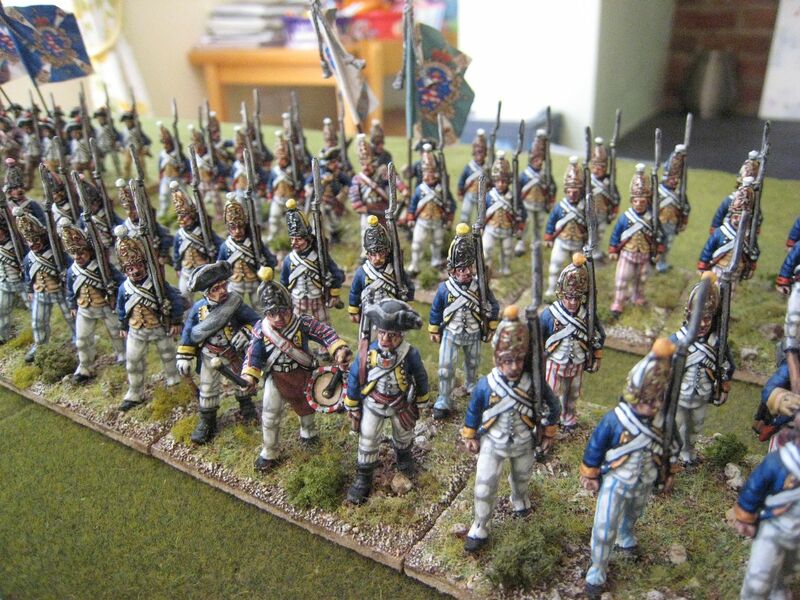 I don't really have any relevant photos, so I've added some of a parade last autumn of my Hessian and Brunswick troops (without the artillery - I forgot all about that). It's been a good while since I painted any German auxiliaries and I just wanted to have a look at them. Happy New Year, everyone.